Bright stripes decorate this vibrant, beachy hammock. It has a relaxing vibe that invites you to lie back, relax, and soak up the sun. It’s extra-long and wide enough for two people to comfortably snuggle up together. Whether you’re relaxing indoors or out, this Sorbus Brazilian Double Hammock will help you do it in style. It comes in blue and green stripes or blue/sand/purple/red stripes. You can hang it either indoors or outside and is easy to relocate. The price is great, too, and low enough for anyone to take advantage. This hammock would be perfect for beginners who’ve never had one, anyone replacing a broken hammock, or couples looking for a special addition to an outdoor space. It’s ideal for warm weather, lounging by a pool, beach, or lake, and can fit in your backyard, too. The construction is durable enough for three-season use. This is a double hammock, so two adults can fit on it. Take it camping with you, and multiple children can swing in it, too. The extra-long length is great for taller users. The maximum weight is for 450 lbs., so this would not be ideal for two people (or more) who’d exceed that body weight. This hammock comes with a handy carrying pouch that’s great for a camping trip. Hanging straps are also included, although they are thin, so you might want some heavier duty canvas straps for stringing up between trees. 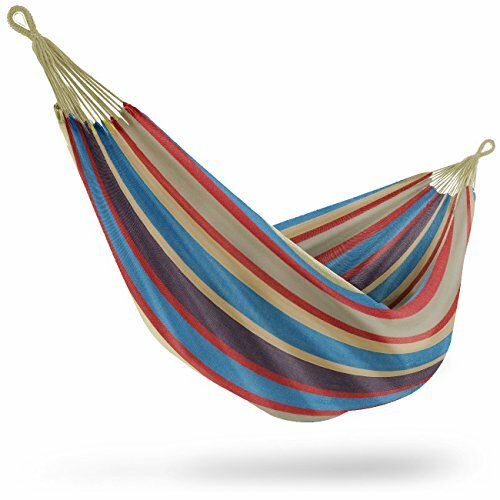 With this trendy and comfortable Sorbus Brazilian Double Hammock, it’s comfortable, colorful, and creates a “cocoon” effect as you lay in it. The extra-long length measures 142” total from end to end, including the ropes at each end. The hammock bed dimensions are 98” long and 60” wide, so you get lots of fabric. Each end has a thick loop so that you can attach it to a stand or a tree. It’s made out of a cotton and nylon combination for both comfort and durable weather proofing; that makes it easy to dry after a rainstorm. This hammock would fit a regular hammock stand although it is very long. When put in the carrying pouch, it measures 13.1” x 9.1” x 4” and weighs just four pounds. Since it’s so small and lightweight, you can easily add it to your camping gear and string it up when you get to the campsite. This colorful and comfortable hammock is great, but we’d like to see it come with better hanging straps. It also could be constructed of more all-weather fabrics, so that it’s durable for use year after year. If you have a hammock stand, then just follow the stand instructions to set this up comfortably. It’ll easily fit 9’ stands. To string it up indoors, you will need heavy-duty carabiners and eyehooks that screw into a stud in the wall. For stringing up between two trees, put each of the cords around the tree and tie it to the loops on each end of the hammock. You’ll probably want to purchase thicker tree straps that have polyester webbing at least 1” thick. Wrap the strap around the tree and loop in on itself. Do a Marlin spike hitch to then attach a carabiner, and then hook the carabiner to the loop on the end of the hammock. Make sure the hammock is high enough off the ground. Based on the hammock measurements, you’ll want to go for trees or walls about 9 feet apart, and longer to give it more tension. After you set it up, just sit in it horizontally, then bring your legs up and lay lengthwise. Wrap the cocoon of fabric around you to create a bed. In fact, some users have a hammock as a bed alternative. It’s great for kids and pets, too. When the Sorbus Brazilian Double Hammock isn’t durable enough for you, then give the Hammock Sky Brazilian Double Hammock a try. This one is more expensive, but it has a much higher quality of craftsmanship, which you can see in the ropes and in the soft woven cotton fabric, too. It has a close weave that is very comfortable. It also comes in a wide variety of colors and is about the same size as the Sorbus Hammock. For less than $30, you can take a lightweight, comfortable, extra-long, and wide hammock with you on your camping trips! Even if you just set it up in your backyard and never take it with you, you’ll still enjoy it every time you use it. Many hammock lovers say it’s their favorite spot because of the fabric and the natural rocking ability. You’ll enjoy your Sorbus Brazilian Double Hammock for years! 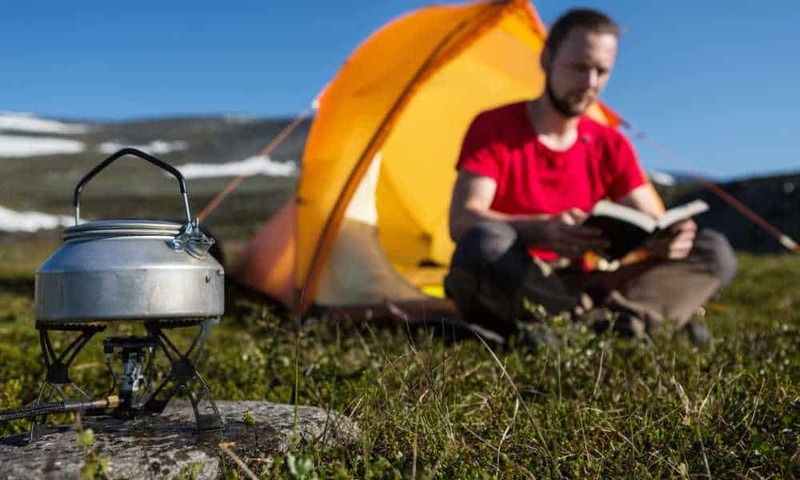 Can You Use a Camping Stove Indoors? Some recommended products may use affiliate links. 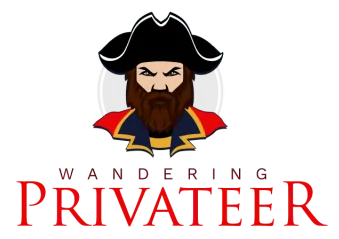 WanderingPrivateer.com is a participant in the Amazon Services LLC Associates Program, an affiliate advertising program designed to provide a means for sites to earn advertising fees by advertising and linking to Amazon.com. Amazon and the Amazon logo are trademarks of Amazon.com, Inc or its affiliates. Copyright © 2018 Wandering Privateer | All Rights Reserved.